ANCHORAGE, ALASKA – The Anchorage Assembly’s recent decision to start fining retailers who hand out single-use disposable plastic shopping bags with each purchase puts the city on a growing list of localities using these measures to reduce litter and help the environment. items like straws, drink lids, and food containers. 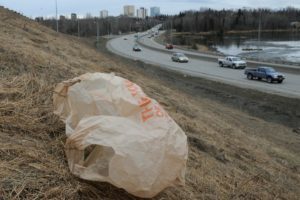 While charging a10-cent fee for paper bags may put Anchorage’s ban on the stricter side of these measures, this is in no way the first time a local government – particularly one in the western United States – has tried to reduce litter by banning plastic bags or charging a fee for their use. And the list doesn’t stop there according to a review of the agendas and minutes Waste Alert reviews for its clients in the municipal solid waste and recycling industry. Bend, Oregon, and Jackson, Wyoming, have discussed similar measures in the past six weeks alone. Local officials in these cities are trying to answer two big questions about bag bans or bag fees: 1) how much of an impact will these bans have on the amount of litter that ends up in our rivers and streams, and 2) will they be worth the cost? A 2016 study by the Economic and Social Research Council that found only 7 percent of shoppers in England took a plastic bag home after the country’s ban went into effect compared to the 25 percent of shoppers who took one home before it went into effect. Meanwhile, bag ban opponents like NOVOLEX – a plastic bag manufacturer that runs the Bag the Ban website – point to the fact disposable plastic shopping bags make up less than 2 percent of a locality’s total waste stream. Thus, reducing their numbers would only have a negligible impact on the total amount of litter that ends up in rivers, streams, and neighborhoods. NOVOLEX also raises concerns about how much time it might take reusable cloth shopping bags to break down in the landfill, how they could transfer bacteria or other food-borne illnesses if not cleaned properly, and the financial burden even a 5-cent per bag fee could have on someone who is living off a fixed income. These concerns could be why 10 states – Arizona, Florida, Idaho, Indiana, Iowa, Michigan, Minnesota, Missouri, Mississippi, and Wisconsin – seem to be bucking the trend by passing pre-emptive legislation banning their localities from banning plastic bags. It could also be why only six of the Anchorage Assembly’s 11 members supported the amendment placing a 10-cent fee on paper bags.